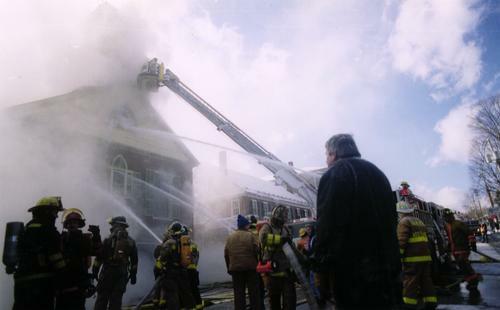 Founder and General Director Edward R. (Ted) Leach (foreground) looks on as fire fighters from 10 towns battle to save the New England Marionette Opera. Every component in the control booth in the balcony melted from the intense heat. Looking up toward the balcony from the main floor. Note the long, drooping Christmas garland left over from the final performances of Amahl and the Night Visitors. Looking from the balcony down toward the stage. 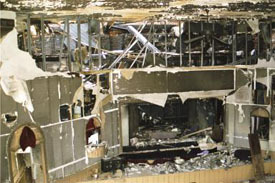 The most intense area of the fire was in the backstage area. All of the roof in that area of the building collapsed into the backstage area. 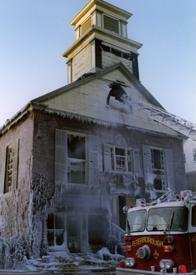 The fire quickly migrated from the rear of the building, through the roof and into the belfry on the front of the elegant 135- seat theatre which was once the Peterborough Baptist Church. 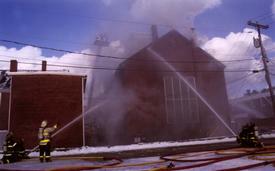 At the rear of the building twin hoses are trained on the burning roof. 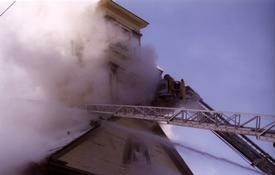 At this point in the fire, all personnel had been backed off from the building for fear of structural failure. The enormous solar panel on the back of the building survived. 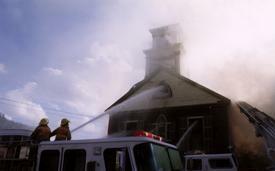 A snorkel truck crew was finally able to break through into the belfry and hit the fire with hoses as evidenced by the huge plume of smoke which has erupted. Fire crews remained on the scene well into the next day. The night of the fire, temperatures plummeted to -14 degrees which turned the burned out building into a surreal ice sculpture. 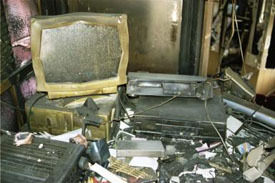 Virtually everything inside the building was destroyed by either the fire or the intense heat. 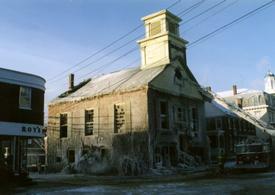 The next day after the fire, the morning sun slowly enveloped the burned out theatre. 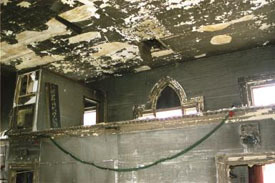 Almost five months after the fire, many of the cast of Porgy and Bess were recovered from the ruins. 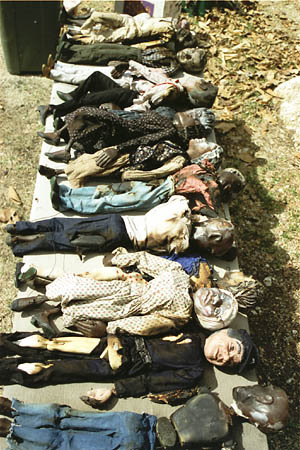 The heat from the fire had fused or disfigured most of the marionettes.